Today is the "Ways To Use It" challenge at SCS (WT373 - Don't stress, Distress!). I haven't made a distressed card for ages - it was fun! 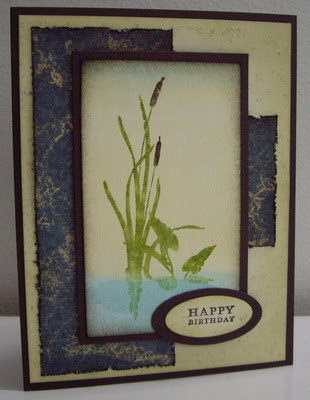 I used a stamp that I've had for a while, but not inked yet ... there are several of those in my art studio :) This is a beautiful stamp from Innovative Samp Creations which features bulrushes growing up out of the water. I decided to watercolor the image using the watercolor spritz technique. I'm really happy with how it turned out and have decided this will make a perfect birthday card for Jeremy ... I know he'll appreciate the watercolor which is one of his favorite mediums to work with. Hope you like. I started by making the main panel. I added water to Baja Breeze re-inker and did a wash (using the large brush) on the bottom and very top of my watercolor paper. I added water to So Saffron re-inker and did a wash in the middle. Once the wash was dry, I inked the stamp with Stampin' Write markers, Early Espresso, Old Olive, and used Certainly Celery for the "reflection" as I wanted it to be lighter. I lightly misted my stamp with water and then stamped onto the watercolor paper, lining up the horizon line of the stamp and wash. Once my image was dry, I want back with a little watered down Baja Breeze re-inker and added more color just over top of the reflection. Once everything was dry, I sponged Early Espresso ink around the edges to give the image an "aged" look. I mounted the panel onto a frame of Early Espresso cardstock. I used Confetti Cream cardstock for the background and stamped the Wonderfully Worn stamp in River Rock ink. I used a sponge and River Rock ink to add more "aging" to the edges. I mounted the background to a card base of Early Espresso. I took two strips of the Well Worn DP and distressed the edges using the Making Memories distressing tool. The roughed edges where white and I thought too stark, so I sponged all the distressed edges of the two pieces with Early Espresso ink. I mounted the two strips on top of the background paper, one horizontally, one vertically. I stamped the sentiment from Happy Moments Stamp Set onto a small scrap of Confetti Cream paper and punched out a small oval. I then sponged River Rock ink around the edges and mounted the oval onto a medium oval of Early Espresso cardstock. I placed the main panel in the center of my card, popping it up with dimensionals to add depth. I mounted the framed sentiment at the bottom corner of the main panel. For the inside, I stamped the Wonderfully Worn stamp in River Rock ink onto Confetti Cream cardstock and then sponged more River Rock ink around the edges (just like the front background panel). I added one distressed and sponged strip of the same Well Worn DP to the left side of the inside panel and then mounted it to the inside of the card base.